would you happen to know the scientific name for anahaw? How tall does it grow and how big are the leaves? Can you post a photo with a person beside it, please? This would be a wonderful tropical effect in a sunroom if it is not too big. Hi Manang, sorry but don't have any photo with person beside the anahaw.. 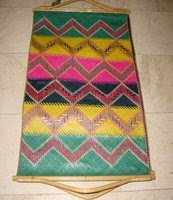 But I did research about it and here is what i found in furniturecebu.com..
in both interior and exterior designs. walking sticks, arrow shafts, spear handles and polo clubs. meters. Like most palms, anahaw grows naturally only in forested areas. 2 meter long fan-shaped leaves which are ascending and crowded at the top. bears small, round, yellowish, and fleshy fruits. are used to cut the leaves that are dried for a purpose. Hello Rose. Good to have you back. Hows your son. Hoping for his early recovery. I had seen anahaw. These pictures made me think of how i wished i could retire in the province. Air is fresh and every thing is so cool. I did see anahaw leaves but it was a long time ago. Hoping of the best for you and your family. Best regards. hi rose, we have so many anahaw growing where we lived before back in my hometown. I havent paid a visit in that particular place for such a long time and i wonder what happen to them now. My daughter has anahaw fun given to her by a friend who had just visited Pinas and she loves it. That must be a very sturdy plant. Your photos are lovely. Hi rose, anahaw is used to make an a fan i think if I am not mistaken. dropping by here, Rose to chck on you guys; hope EJ is feeling better now. Hi Rose! What is that in the last photo? Is it a floor mat or a wall decor? Either way, ganda sya! ang ganda ng tanim nyo. btw sis, welcome back to blogosphere. hope everything is well na with you and your family. i prayed for your brother. I haven't seen an anahaw yet but I guess I have seen a product made of anahaw.I hope EJ's fine by now. iyong bahay namin dati sa batangas ang bubong sasa, parang anahaw din. masarap kase malamig. tapos ang baon namin nakabalot sa dahon ng saging. nakaka-miss din ang ganoong buhay minsan, simple. Ang laki naman ng anahaw ng nanay mo rose, most of the anahaw na nakita ko sa atin maliit lng, at ang ganda ng pagkakuha. Kumusta na nga pala joops mo? sana okay na. I grabbed your badges na nga pala tsang. I agree with you hon, the anahaw makes the house cooler compared to house with G.I roofs..